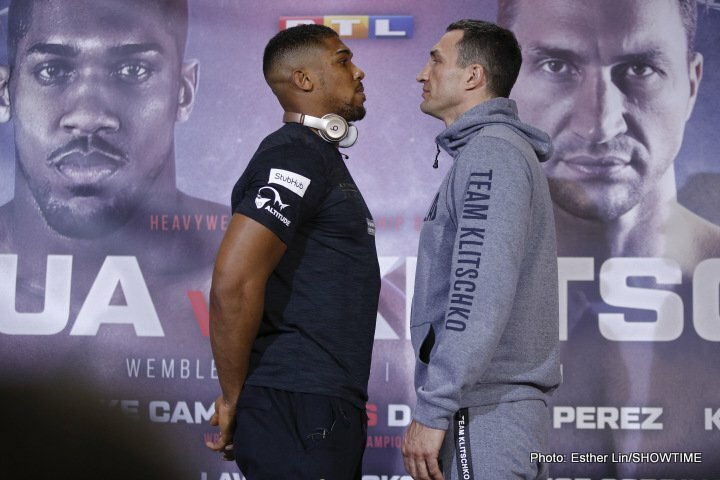 Soon after 10pm in London on Saturday night, Anthony Joshua will meet Wladimir Klitschko in an incredibly interesting heavyweight match up to contest the IBF world title that is held by the former and the WBA and IBO belts which are vacant. But forget draining the alphabet soup of titles for this one, because the real fascination in the clash between these two former Olympians is in the questions that only Wembley Stadium can answer on 29th April. Is Wladimir Klitschko too old? Is Anthony Joshua too young? Is Wladimir Klitschko too experienced? Is Anthony Joshua too inexperienced? Will this be the start of a Hall of Fame career for Joshua or the end of a Hall of Fame career for Klitschko? SKY Broadcasting’s multi-platform marketing copy has included the questions “Still Great?” or “Future Great?”. And whilst we will get answers to these questions before Big Ben tolls midnight, there are plenty more to ask if we are looking for a clearer picture of where we’re at with boxing’s big cats and who the alpha of the pride really is. The current heavyweight landscape is a fractured one, with portions of the titles spread across three continents in the shape of America’s WBC champion Deontay Wilder, New Zealand’s Joseph Parker and of course the European ownership to be confirmed very shortly. But whoever takes the spoils on Saturday, that winner must join the aforementioned duo of even less proven title holders in the elongated shadow of the man who beat the man before beating himself, Tyson Fury. Fury, a man of fantastically entertaining circus tent antics outside of the ring is a masterful ringmaster within it, whose sublime humbling of Wladimir Klitschko on a November night in Dusseldorf back in 2015 remains one of the single most underappreciated achievements of any British boxer. Whether Saturday night is the sunrise of Joshua’s career or the sunset of Wladimir Klitschko’s, all that will really be confirmed is who moves forward towards a defining High Noon when Tyson Fury rolls back into town.